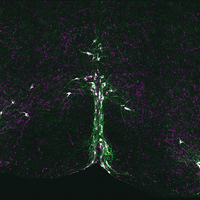 Tau proteins disrupt the movement of molecules into and out of neuronal cells’ nuclei. B. Eftekharzadeh et al., “Tau protein disrupts nucleocytoplasmic transport in Alzheimer’s disease,” Neuron, 99:925–40.e7, 2018. Dotted along the edges of neuronal cells’ nuclei are protein complexes that act like border agents, carefully monitoring the RNAs and proteins that move into and out of the command center of the cell. 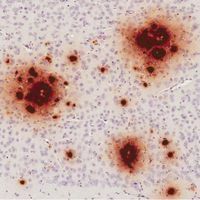 Disruptions at the border—such as an improper flux of certain proteins—can cause problems for the cell and may underlie Alzheimer’s disease (AD) and other neurological conditions. Researchers have previously linked defects in the gatekeeping protein structures—called nuclear pore complexes—with aging, amyotrophic lateral sclerosis, and other neurological diseases. But a new study “demonstrates that nuclear pore impairment seen in AD is likely a primary target of the disease, rather than a nonspecific defect,” Hong Joo Kim, a cell and molecular biologist at St. Jude Children’s Research Hospital who was not involved in the work, tells The Scientist. Past studies have shown that nuclear pore impairment is related to rogue tau proteins moving from the microtubules in the axons of neurons to the cytoplasm. Clumping of the tau proteins has long been associated with AD. 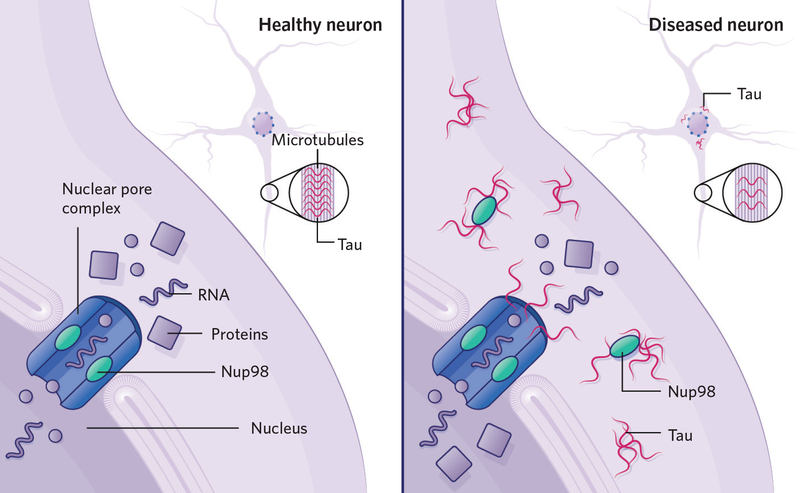 Bradley Hyman, a neurologist at Massachusetts General Hospital and Harvard Medical School, and colleagues wanted to understand exactly how tau is involved in neuronal cell damage. 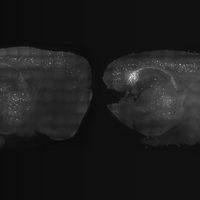 By staining and imaging tau and other proteins in the brains of humans with and without the disease and in wildtype mice and transgenic mice expressing mutant human tau, the team found that tau interacts directly with Nup98, a building block of nuclear pore complexes. 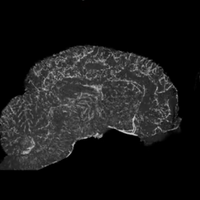 In diseased brains, some Nup98 appears to be misdirected to the cytoplasm. In addition, experiments in cultured cells in which Nup98 was placed in the cell cytoplasm showed it helped to enhance tau aggregation there. “The neatest part of the research is that we may have found a mechanism of toxicity for tau,” Hyman says. Tau appears to draw Nup98 out of the nuclear pore complex, disrupting its operations, and then Nup98 helps tau aggregate, leading to cell death. Tau aggregates did seem to alter nucleocytoplasmic transport, Roy Parker, a biochemist at the University of Colorado Boulder who coauthored a perspective accompanying the new paper, writes in an email to The Scientist. However, “I was not convinced that the interaction with Nup98 was the fundamental mechanism behind this effect,” he says. Many protein aggregates disturb movement between the nucleus and cytoplasm, he explains, but not all of the mechanisms are well understood, and others may be at work in Alzheimer’s disease.